Now available. Click here to purchase at Indiebound. The digital economy has gone wrong. Everybody knows it, but no one knows quite how to fix it, or even how to explain the problem. Workers lose to automation, investors lose to algorithms, musicians lose to power law dynamics, drivers lose to Uber, neighborhoods lose to Airbnb, and even tech developers lose their visions to the demands of the startup economy. • Accept that era of extractive growth is over. Rather, businesses must – like eBay and Kickstarter – give people the ability to exchange value and invest in one another. • Eschew platform monopolies like Uber in favor of distributed, worker-owned co-ops, orchestrated through collective authentication systems like bitcoin and blockchains instead of top-down control. • Resist the short-term, growth-addicted mindset of publicly traded markets, by delivering dividends instead of share price increases, or opting to stay private or buy back one’s own shares. • Recognize contributions of land and labor as important as capital, and develop business ecosystems that work more like family companies, investing in the local economies on which they ultimately depend. Rushkoff calls on us to reboot this obsolete economic operating system and use the unique distributive power of the internet to break free of the winner-take-all game defining business today. 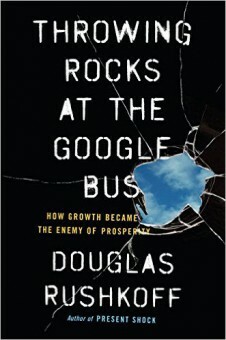 A fundamentally optimistic book, THROWING ROCKS AT THE GOOGLE BUS culminates with a series of practical steps to remake the economic operating system from the inside out—and prosper along the way.